Seeing as I suffer from a very severe sun allergy the one thing that I am always on the lookout for, is an effective product that offers broad spectrum protection while at the same time keeps the skin supple and not greasy. When I saw this Vivel product that claimed to fulfill my above mentioned requirements I immediately pounced on the product. Looking at the MRP I realized that it is also wallet friendly, so there’s my first pro about this Vivel Perfect glow Multi layer skin tone corrector with SPF 15. Quite a lengthy name! 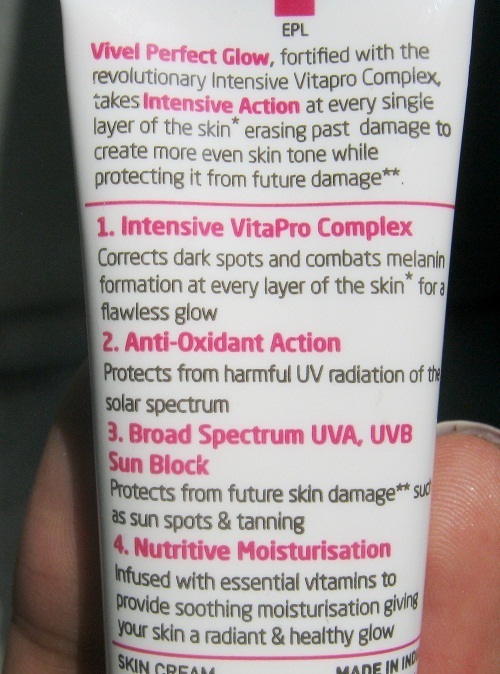 Claims: Vivel Perfect Glow is fortified with the revolutionary Intensive Vita Pro Complex that effectively targets dark spots at every layer of the skin and its Anti-Oxidant Action protects the skin from harmful UV radiations of the solar spectrum to give you flawless even-toned skin. What's more ! Broad-spectrum SPF 15 protects your flawless glow from the sun damage. 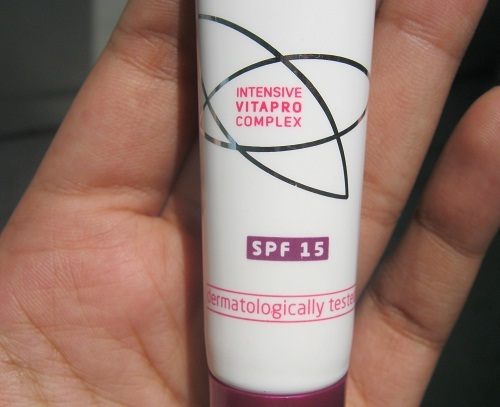 My take on product: I bought this Vivel Perfect Glow SPF 15 when my trusty French L’Oreal sunscreen got over and I was in dire straits to find a replacement, seeing as that particular one isn’t available in India. While I didn’t exactly think that all the claims would be fulfilled, I did hope that atleast a few would be. The first claim of broad spectrum sun protection does seem true to a certain extent seeing as I didn’t suffer from sun tanning or any adverse sun allergic reaction while using this product, but please note that I used this product in tandem with another sunscreen because SPF 15 isn’t enough for someone allergic to the sun. It is moisturising to a certain extent, but severely dehydrated skin may not find this enough. It certainly doesn’t have a greasy finish, instead it almost has a semi matte finish but the problem is the whitish cast that it leaves behind that looks a tad awkward on dusky beauties. The packaging is attractive and travel friendly. The squeeze-nozzle dispensing system helps in keeping the product uncontaminated and thereby, hygienic. Nope! It wasn’t all that effective for me. Sounds okay okay but really inexpensive. oh whitish cast. such a dud product! Great review dear!